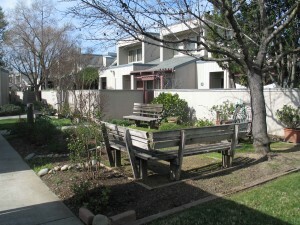 Dos Pinos cooperative housing, Davis, California. Photo by author. Sarah and I are long-term Shambhala Buddhist practitioners. As we approach retirement age, we’ve been thinking about how, where and with whom we would like to spend the rest of our lives. I’ll bet many of us are considering the same questions, and wondering whether some of us could get together and create an intentional community. We have found that such a venture would involve not only large amounts of readily available cash but also require intensive planning, shared goals, time frameworks, and agreement on a geographic location. Bringing all these aspects together simultaneously presents quite a challenge. One day, as we were discussing our yearning to live with other sangha members, it dawned on us that perhaps others might be interested in moving to Dos Pinos, the limited equity housing cooperative where we currently live. Since then, we have talked to others about it and one of our sangha friends has already moved here. It’s wonderful having her nearby. Dos Pinos Housing Cooperative looks like other apartment complexes here in Davis, California. Nine buildings contain four to nine apartments each, with shared common space and amenities including a swimming pool, hot tub, laundry room, and a community room for parties. It’s adjacent to a city-maintained green belt, bus routes, and a shopping center. However, it is a limited equity housing cooperative, not rental property. The cooperative maintains the physical plant, so we never worry about mowing the lawns, cleaning the pool, re-roofing, air conditioning and heating, painting or general repairs. Resident [shareholders] own shares in the cooperative and benefit from mortgage interest and property tax deductions, but do NOT share in any equity appreciation (or depreciation, for that matter). There are one, two, and three bedroom units, with share costs varying from $15,000 to $25,000 [one-time, annually, or..?]. In order to move in [purchase? ], interested parties submit an application, complete an interview, and are placed on a waiting list. The waiting period varies, depending on unit turnover and applicant’s ability to move quickly. More information on Dos Pinos is available online here. Residents of Dos Pinos are a nice mix of single folks, families (some with young children,) and senior citizens. When I first visited here, the atmosphere reminded me strongly of the warmth, caring, and camaraderie of my 1990 seminary at Shambhala Mountain Center. It is a bit like living in a small town – there are a few rather inquisitive neighbors, a few too many rules (mostly ignored) but is mostly a quiet, very safe, and respectful environment with a variety of interesting people. In addition, the city of Davis is famous for its wonderful farmers market, a campus of the University of California, and its very own Davis Shambhala Center. Davis is located in rural Yolo County, home to numerous organic farms and orchards. The winters are mild, summers hot, and the San Francisco Bay Area, the Sierra Nevada mountains, and the wine country of Napa and Sonoma counties are all only an hour or so away. We are also located only minutes from the state capitol, Sacramento, one of California’s fastest-growing cities. If YOU might be interested in finding out more about living in this sort of community, please contact us. We would enjoy sharing with you our experience of and information on Dos Pinos Housing Cooperative. I wish this article was actually about co-housing. The title is a bit incorrectly stated. It would be good to start a conversation about the possibilities of creating a co-housing settlement, even if the specifics would be challenging that should not be a deterrent. My guess is it would be worth all the trouble and future generations would exalt in the efforts expended. Onward! my friends! onward! are you still interested in doing something?